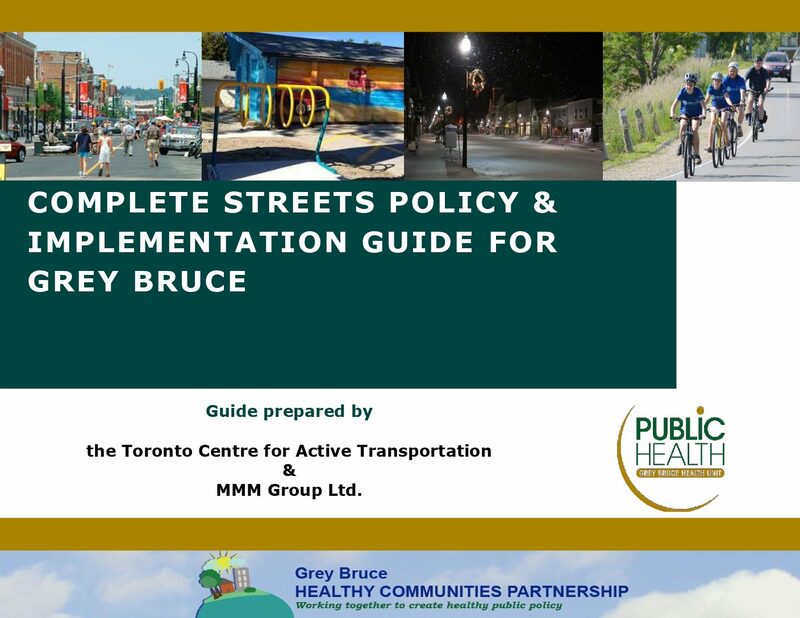 In February 2015 The Centre for Active Transportation (TCAT), in collaboration with MMM Group, was commissioned by the Grey Bruce Health Unit to prepare a Complete Streets Policy & Implementation Guide for Grey Bruce. The goal of this project was to develop a “made in Grey Bruce” Complete Streets policy guide which responds to the unique context of this rural region. The guide, released in March 2015, is intended to provide foundational policy support for implementing Complete Streets in Grey Bruce. It provides an analysis of key concerns in Grey Bruce and examples of approaches other municipalities have used to address challenges in Complete Streets implementation in the rural context. It is also a reference guide of best practices and emerging trends of successful Complete Streets policies and implementation.